All fathers want the best for their children. Yet out of their own frustation they sometimes overdo it. Sid Greene was like that as a father and it was plain to see why. As a 16-year-old engineering apprentice he was hit by a bus, and while his bike was destroyed, so was his left arm. The sobering experience made the now one-armed adolescent into the fearsome and demanding man he came to be. First as a 30s racer at Brooklands and Donington Park, then during the war as an aircraft recognition instructor in the Observor Corps, rising to the rank of acting Wing Commander RAFVR. Nicknamed the Wingless Wonder, he always wanted to beat all who were sound of life and especially limbs - or at least try to do so. When peace set in Greene returned to racing in the same mould as Archie Scott-Brown or Alan Stacey did, but just not that good, continuing his active career until 1953, when he was 47 years old. Although he had shone in RAF service his car racing activities never set the world alight. Which is probably why he so dearly wanted his son Keith to not just follow in his father's footsteps but in fact accomplish what his old man's disability had prevented from achieving. Ironically, Keith Greene actually did so, but as a team manager, emphatically not as a driver. Towards the end of his racing life Sid Greene had set up Gilby Engineering Co Ltd, a fairly large engineering company that also became the vehicle for young Keith's driver career as well as a car bearing the company's name. In 1954, the year father Sid started out as a serious British entrant, Keith was only 16 years of age. So Sid acquired a potent Maserati 250F and signed allrounder and Aston Martin sportscar stalwart Roy Salvadori to race it. Mainly focusing on national events Salvadori and the Gilby Maser ventured abroad once or twice a year between 1954 and '56 while always qualifying well up at their home Grand Prix at Aintree or Silverstone. There came however nothing in the way of results. In 1957 Salvadori left for Cooper, so Greene invited another allround racer, Ivor Bueb, the 1955 Le Mans winner (about to become the 1957 winner as well) to drive his 250F in British events, while he also started entering Keith in handicaps before giving his son a Cooper sportscar to deal with. In 1958 this became a Lotus Eleven, and so the first association with Lotus - which was to become a very significant one for the team - was made. In single-seaters, however, Gilby Engineering traded its ancient Maserati for an F2 Cooper-Climax T45, with which Keith - now the driver around whom Greene faithfully built his racing enterprise - achieved some encouraging results. At the start of the year Keith took a splendid second in the Aintree 200, only allowing the Ferrari of Jean Behra in front. In serious international events, such as the British GP at the same track, it was an entirely different matter as young Greene was thoroughly outpaced in practice. In 1960 Keith tried again at his home World Championship event, his T45 now Maserati-powered, lining up 22nd out of 25 cars but retiring from an overheating engine. Gilby also continued to race in sportscars and this was to provide the detour to building their own F1 chassis. In 1959 the team acquired a Lotus 17 that failed to make an impression on the Greenes. So when Chapman fired his first assistant designer, who at the time was none other than Len Terry (the man to produce such cars as the drop-dead gorgeous Eagle T1G and the hideous and non-performing BRM P207), Sid Greene employed Len on the spot, to help him cure the Lotus' handling problem. Working together, Greene and Terry soon launched their own Gilby-Climax sportscar, which came out in 1960 and had some moderate success. One year later, a 1.5-litre F1 car also rolled out of the workshop… Its total cost of development: 5000 pounds! Always intended to be a low-budget operation, the car was expressly designed by Terry to be run from a modest garage. It consisted of a light spaceframe made of round and square ¾-inch steel tubes triangulated around the cockpit and with a detachable top member across the engine bay. Its drive came from an FPF and 5-speed Colotti gearbox. The front suspension was by coil springs and double wishbones while the indepedent rear suspension was by double wishbones as well. The disc brakes were by Girling, the cast wheels from Cooper Elektron. Above all, the car's lines were beautifully shaped and created out of aluminium, the machine in total weighing in at around 1000lbs. The car becoming Keith Greene's tool for 1961, the young driver immediately set about testing it at Goodwood. He eventually came down to a 1m35s but then works Cooper driver Bruce McLaren was invited to give the car go, the Kiwi taking its best time down to a whopping 1m28.9s, which was in fact mere a tenth off the lap record. The potential of the Climax-engined car bouyed all at Gilby enormously and the shoestring enterprise was entered in the British GP, the Danish GP, and five British events. At Aintree Keith managed to qualify 23rd from 30 cars and finished the race 15th, 6 laps down on Wolfgang von Trips' Ferrari. Late in the season, Gilby came out again for the Lewis Evans Trophy sprint event at Brands Hatch. Keith took fourth, their best result by far. For 1962, the arrival of a BRM engine was eagerly awaited. Len Terry especially designed a new chassis to take it on but then found out that the BRM V8 was an underpowered powerplant compared to what Bourne supplied to its works team. With the Climax car Keith Greene had strung together an impressive run of placings in minor events: fourth at the Brussels GP, the Lombank Trophy at Snetterton and the Lavant Cup at Goodwood. Greene then went on to take an excellent third in the Naples GP. Keith made another British GP appearance but this time he was just taking a practice spin in Tony Shelly's John Dalton-entered Lotus 18/21. With the BRM the Greenes were put back in place at the Nürburgring (our picture) where Keith qualified a minute off the pace and retired after the front suspension collapsed. At Enna, he finished seventh and at Monza followed a non-qualification. With no starting money forthcoming that was the end of the line for Gilby Engineering Co Ltd, which had fallen into the hands of a company demanding its financial soundness if it were to be allowed to continue its racing activities. Of course, the F1 enterprise was always going be a money pit, so the workshop was wound up at the end of 1962. The Climax car was sold to a special builder while the BRM car found its way to privateer Ian Raby who campaigned the machine in the 1963 season (here Ian is seen at the International Trophy). Raby qualified 19th for his home event and took third in the very minor Rome GP at Vallelunga won by Bob Anderson's DW Racing Enterprises Lola. However, he was a non-qualifier in the other two Championship events he entered. With Raby switching to a Brabham BT3 the Gilby passed through various hands to end up as a sand racer in Jersey. It is said to be undergoing a restoration right now. Keith Greene continued in sportscars and GTs well into the sixties. He had been a moderately talented driver upon whose small shoulders the success of an entire Grand Prix operation was thrust. Len Terry's first F1 car had been a pretty good one, as Bruce McLaren so meticulously showed at Goodwood early in 1961, but sadly Greene Jr just wasn't up to it to fulfil Greene Sr's dreams of becoming the Grand Prix star Sid was kept from becoming. As a team manager, however, Keith had far better business instincts than his father, running several outfits in the seventies and eighties. So although he never became what his father never came to be, he did do better in what his father actually did. Keith Greene races the new Gilby Engineering chassis in the 1962 German GP at the Nürburgring. Keith Greene's father Sid, had been a racecar driver, despite having lost his left arm at age 16. Sid Greene raced in England before the war, flew Spitfires for the RAF during the war, and returned to racing after the war. He had also started the Gilby Engineering company. Greene had retired from racing in 1953, but continued entering cars in British events. The elder Greene wanted his son to achieve in racing what he was not able to. When the Lotus 17 that Gilby Engineering had bought proved to be disappointing, the company decided to build its own racing sports cars. Sid Greene had hired former Lotus designer Len Terry to work on the Lotus and then let him work on the design for the sportscar. It was then only a short step to create a Formula 1 racecar for 1961. The new Gilby F1 car had a triangulated steel tube spaceframe covered with an aluminum skin. The car had a double wishbone and coil spring front and rear suspension. The Gilby was powered by a Climax FPF engine, which ran through a Colotti 5-speed gearbox. The car was entrusted to Sid's son Keith. 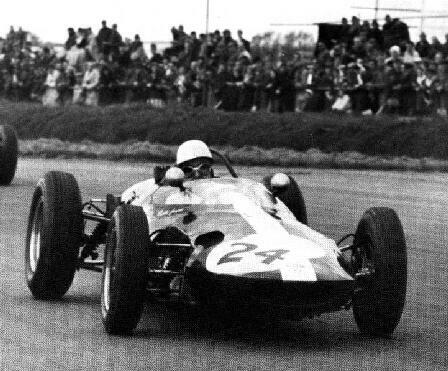 Keith Greene had made his F1 debut in a Gilby Engineering entered Cooper T43-Climax in the 1959 British GP at Aintree, where he failed to qualify. He made his first world championship start at Silverstone in a Gilby Engineering Cooper T45-Maserati, starting twenty-fourth and failing to finish with overheating problems. In a test session at Goodwood, Keith managed to post a lap of 1m35s. 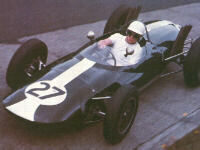 Then the car was turned over to Bruce McLaren who ran a time of 1m28.9s, just off the track record. The car and Keith were entered in several non-championship races and the 1961 British GP at Aintree. Keith started the British GP twenty-third and finished fifteenth and six laps down. The best finish for the car was a fourth place in the Lewis-Evans Trophy race at Brands Hatch. For 1962 a 6-speed gearbox was added and Greene posted fourth place finishes in the non-championship Brussels GP, the Lombank Trophy race, and the Lavant Cup. The increase in experience for the driver seemed to have helped. The team added a third place finish in the Naples GP. Then Gilby Engineering received their BRM V-8 engine and placed it in the back of a new chassis. Terry believed that customer BRM engines were significantly less powerful then the engines the works teams were running. The new chassis and engine appeared for the German GP at the Nürburgring and qualified more than a minute off the pole. The race ended with suspension failure after seven laps. That debut was followed up by a DNQ at Monza. The Gilby engineering firm had run into financial difficulties and had been taken over by another company. It would close its doors in the end of 1962. Keith Greene would not make another championship appearance. The Gilby chassis would be entered by Ian Raby in three races in 1963 without any success.